By Joshua Kahn Russell and Harmony Goldberg. The conversation within the movement has been fascinating, and reveals some key pitfalls that the resurgent U.S. Left might fall into if we’re not careful. 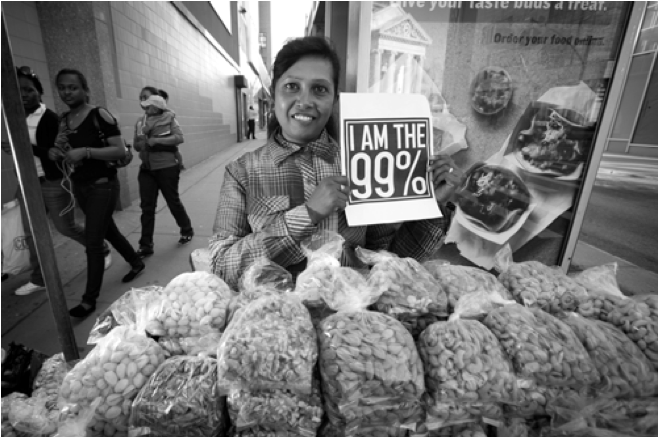 Grassroots groups that organize primarily in working class and communities of color such as National Peoples Action and the National Domestic Workers Alliance helped lead the 99% Spring process. Despite this, the terms of the debate have almost exclusively centered on the participation and limits of MoveOn.org (as a symbol and stand-in for more moderate liberals, the institutional left, and the nonprofit industrial complex). “Are the liberals co-opting Occupy?” or “Is Occupy co-opting the liberals?” There is indeed a historical precedent of radical peoples’ movements becoming de-fanged by the status quo. And yet, too often, the historic limits of the Left in the United States has been connected to its internal tendency towards sectarianism and the politics of purity. At this moment, our own circular firing squads may be a deeper threat to the viability of our movements than “outside” groups. It is precisely because of our long-term work with radical grassroots movements that both of us dove into helping organize 99% Spring. We were each involved in writing the curriculum and designing the trainings. We were challenged by, and learned a lot from, the process. Our organizations (the National Domestic Workers Alliance and the Ruckus Society) are both movement groups that support frontline communities speaking and acting for themselves, and we were both part of the left wing of the 99% Spring alliance. We are living in an incredible time. Occupy has helped us all re-imagine political vision and strategy. 99% Spring was a bold effort with a lot of success, real limitations, and some mistakes. We want to share our experiences from the heart of 99% Spring project to help our movements think more clearly about alliances, and some of the challenges that our political moment presents us. We are at a crossroads as a movement. Many have been slogging away in the trenches for years, pushing against the political winds and doing the slow work of organizing to build popular power within communities hit hardest by the economic and ecological crises. It was hard work, and it moved slowly. Last fall, Occupy exploded on the scene and challenged many of our assumptions about what was possible. By offering both an inspiring political tactic (“occupy”) and a unifying frame (“We are the 99%”), the Occupy movement was able to tap into the mass anger about the crisis that had been brewing for years. Occupy showed that it was possible to have an explicitly radical message, to engage in confrontational action and still speak to millions of people in this country. It became acceptable to talk about economic inequality, corporate greed and capitalism, and that changed the context for all of our work in important ways. It was a humbling moment for many long-term organizers. It also helped reveal some of the shortcomings of the institutional left. But now what? Like all movements, we have challenges. Most physical occupations have been evicted by the police, removing the ongoing public spaces that made us visible, and the ongoing police confrontations aren’t tapping into organic mass anger in the same way. Many of our internal challenges make it difficult to do the big-picture strategic thinking we need to envision the next steps. This offers us all a moment of experimentation and innovation. In order to engage it, we need to seriously reflect on our circumstance. I am excited and honored to be one of 60 contributors to a new book called Beautiful Trouble: A Toolbox for the Revolution. The book reads as an activists manual, weaving together case studies, principles, theories, and tactics, distilled from years of working in many movements for social change. Here is one of my entries in the book, based on lessons from Training for Change, the Highlander Center, Ruckus Society, and others. Shift the Spectrum of Allies. In sum: Movements seldom win by overpowering the opposition; they win by shifting the support out from under them. Determine the social blocs at play on a given issue, and work to shift them closer to your position. Activists are often good at analyzing systemic social problems, but less good at thinking systemically about organizing. Activism is about using your power and voice to make change. Organizing is about that, too, but it’s also about activating and empowering others. It helps to think in terms of groups. Successful movement-building hinges on being able to see a society in terms of specific blocs or networks, some of which are institutions (unions, churches, schools), others of which are less visible or cohesive, like youth subcultures or demographic groupings. Analyzing your spectrum of allies can help you to identify and mobilize the networks around you. 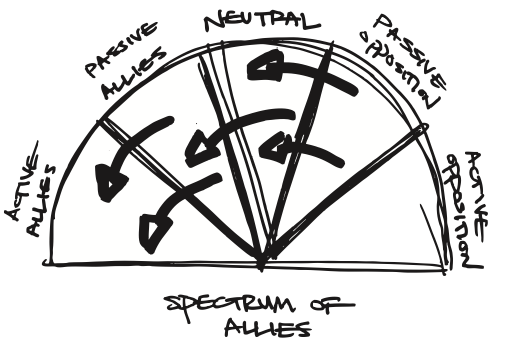 A spectrum-of-allies analysis can be used to map out a local campaign or to strategize for a whole social movement. Here’s how a spectrum-of-allies analysis works: in each wedge you can place different individuals (be specific: name them! ), groups, or institutions. 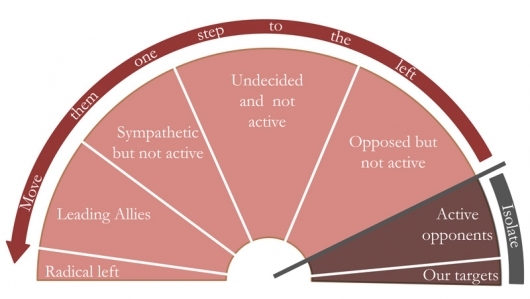 Moving from left to right, identify your active allies: people who agree with you and are fighting alongside you; your passive allies: folks who agree with you but aren’t doing anything about it; neutrals: fence-sitters, the unengaged; passive opposition: people who disagree with you but aren’t trying to stop you; and finally your active opposition. Some activist groups only speak or work with those in the first wedge (active allies), building insular, self-referential, marginal subcultures that are incomprehensible to everyone else. Others behave as if everyone is in the last wedge (active opposition), playing out the “story of the righteous few,” acting as if the whole world is against them. Both of these approaches virtually guarantee failure. Movements win not by overpowering their active opposition, but by shifting the support out from under them. For example, in 1964, the Student Nonviolent Coordinating Committee (SNCC), a major driver of the civil rights movement in the U.S. South, conducted a “spectrum-of-allies style” analysis. They determined that they had a lot of passive allies who were students in the North: these students were sympathetic, but had no entry point into the movement. They didn’t need to be “educated” or convinced, they needed an invitation to enter. To shift these allies from “passive” to “active,” SNCC sent buses north to bring folks down to participate in the struggle under the banner “Freedom Summer.” Students came in droves, and many were deeply radicalized in the process, witnessing lynching, violent police abuse, and angry white mobs, all simply as a result of black people trying to vote. Many wrote letters home to their parents, who suddenly had a personal connection to the struggle. This triggered another shift: their families became passive allies, often bringing their workplaces and social networks with them. The students, meanwhile, went back to school in the fall and proceeded to organize their campuses. More shifts. The result: a profound transformation of the political landscape of the U.S. This cascading shift of support, it’s important to emphasize, wasn’t spontaneous; it was part of a deliberate movement strategy that, to this day, carries profound lessons for other movements. Douglas McAdam, Freedom Summer. Oxford Univ. Press, 1988. 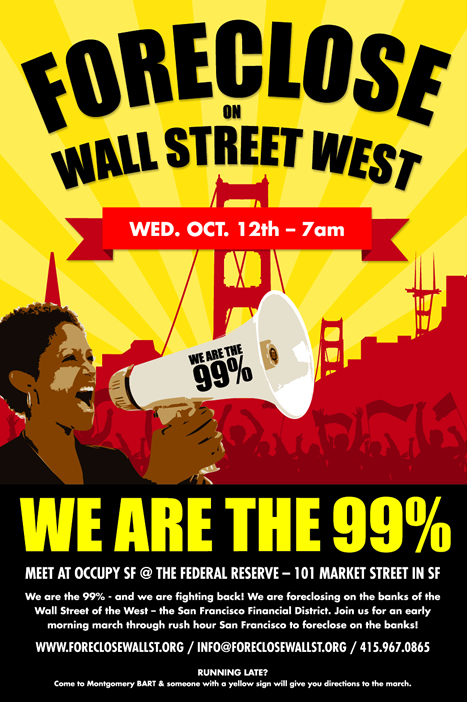 One of my favorite things about #OccupyWallStreet is that its turning everyone into a movement strategist. Everyone has advice or criticism. The fact that its a large-container has made everyone wanna talk about organizing, strategy, analysis, message, demands, direction, etc. Getting thousands to think critically about movement building is a gift. Boston shows us how to #Occupy with purpose and political vision. Three Reasons Why I Love Occupy Wall Street. Occupy Wall Street: Perfectly Coherent. In Front and Center: Critical Voices in the 99%. Wanted to make a quick personal update – shortly after leaving Salt Lake City to train & help coordinate actions for Tim Dechristopher’s trial, I am now in Washington DC for the next few weeks. We are coordinating sit-ins for 14 days in a row, where 50-100 people are risking arrest each day at the White House to draw attention to, and ultimately stop, the Keystone XL Pipeline. Thousands have signed up to participate, and we’ve already seen overwhelming media attention. This pipeline would another tentacle on the largest fossil fuel development on the planet, the Alberta Tar Sands, and NASA climatologist James Hansen calls it “game over for the planet” if it goes through. So we’re drawing a line in the sand for Obama. I’m here as a trainer and action coordinator, helping organize and prepare participants to commit an act of civil disobedience, and help navigate & facilitate the experience with them. Many are risking arrest for the first time. It’s an honor to support them through it, and even though we are just beginning, this action already feels historic. It’s particularly nourishing to me that so many of the participants are of an older generation – its a thrill getting to train people twice my age. On our first day, the youngest person arrested was 17, and the oldest was 71. There is of course a lot more to say, but unfortunately we don’t get time to write much these days… though I am updating twitter regularly. In other brief news, my booklet/organizing manual Organizing Cools the Planet, co-authored with Hilary Moore, comes out in a couple weeks. I can’t wait. What I learned from spending 5 minutes looking at a Tea Party twitter feed. I’ve been thinking a lot lately about the activist filter bubble, the reverberating echo-chamber of insular social media and political networks that keeps progressives marginal and talking to ourselves. Recently, I’ve had several different Tea Party twitter accounts follow me (at least four this week alone) and began talking to friends about whether or not this means they are 1) building lists of progressive activists for potential future smear-campaigns; 2) following their opposition so they can Retweet things out of context to scare/outrage their base; or 3) genuinely interested in hearing perspectives outside their own echo-chamber. Whatever their purposes, it reminded me that we can learn a lot from the way our opposition presents itself through social media forums (of course there is a lot of deception and other missteps that we don't want to emulate, but there are some transferrable best practices mixed in too – here’s some of both). A few minutes ago I got an email notice that @TheTeaParty_net is following me. I already know what they stand for and I haven’t even looked at their twitter feed yet. In fact, their statement of values is likely the thing that will make me choose to look or not look. 2) Constant creation of an “us vs. them” narrative, inviting people to identify as part of their group (“us”) and asking people to take a small action (retweeting) to signal their insiderness. A kinestetic action simple as pressing a button helps solidify the choice that was made by the tweeter. It asks them to take a stand, pick a side, and then reinforces that choice with a physical action that their peers can see. They ask their tweeps to do this on a regular basis. Church this morning must have been quite awkward for some people. The sermon might have gone something like “I know we’re all disappointed that the rapture didn’t come, but don’t worry, its not like it’s the end of the world or anything.” Ha ha. I was among many progressives making fun of the rapture all day yesterday, but ultimately the joke might be on us. When it comes to global warming and climate chaos, the script is a bit too familiar. According to a recent poll, 44% of Americans believe increased severity of “natural” disasters is “evidence of biblical end times. ” That’s nearly half the people in the most powerful country on Earth. 38% believe God uses Nature to dispense justice. It’s an important poll that climate change activists and sensible people everywhere should take seriously. The #rapture meme picked up remarkably fast. 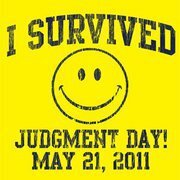 While some have seen billboards declaring May 21st, 2011 to be Judgment Day for a while now, it wasn’t until a couple of days ago that it started getting into the media and many Americans learned that a small fundamentalist sect believed they uncovered the true date of the Beginning of The End. Within a few days over a million people joined multiple “post rapture looting” facebook events, pranks were being played across the country, it was all over the news, and people were cracking jokes on twitter like there’s no tomorrow. So why did that meme spread so quickly? Unfortunately biblical notions of the coming Apocalypse are not just entrenched in our culture, but are also rearing their ugly heads in our political landscape. And they’re shaping policy. John Shimkus, The Republican Congressman who hoped to chair the House Energy Committee told reporters this Autumn that we didn’t need to take action to reduce greenhouse gasses because he knows the planet won’t be destroyed. How does he know? God told Noah that it wouldn’t happen again after the Great Flood. Obviously. Shimkus went on to clarify that “The earth will end only when God declares its time to be over.” And its not just Shimkus – the November election saw a wave of new Republican leadership hell-bent on scriptural justifications for inaction on global warming. In his excellent article Apocalyptic beliefs hasten the end of the world, Jason Mark discusses the depth of biblical explanations used to explain the recent Mississippi river flooding and tornado in Alabama. He cites “two surveys by the Pew Center [that] reveal what climate campaigners are up against. According to a 2010 Pew poll, 41 percent of Americans believe that Jesus will return by 2050. A roughly similar number — 36 percent — disagree that human activity is causing global temperatures to rise.” Jason points out that while causality between these two stats is dubious, worldview clearly plays a significant role in the public’s response to climate science. Beyond the Choir is publishing a valuable series of articles getting at the root of human behavior and ways we are hard-wired for collective change. Below are four articles from Jonathan Smucker. Check em out. In this series I explore how evolutionary theory might help to explain the origins and logic of collective action, and how it might inform the thinking and strategies of progressive change agents. This is the landing page for the series. You can bookmark it and check back for new posts, which I’ll be linking to from this page.